Ideal for moderate weight loads and all-purpose back-of-the-house duties as well as constant use over various standard floor surfaces. Tubular frame incorporates handles with U-frame construction for structural strength. 20 gauge stainless steel shelves have reinforced edges for heavy loads. Easy to clean and sanitize, simply steam clean or wipe down. NSF listed. 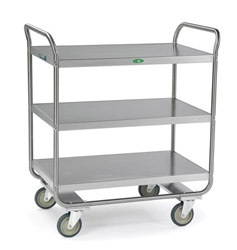 Utility Cart Chrome Plated Legs/Frame: 3 shelf; 18" W x 27" L; 9-7/8"
Ergo-One System Utility Cart: 2 shelf; 18" W x 27" L; 13-1/8"
Ergo-One System Utility Cart, medium duty: 2 shelf; 21" W x 49" L; 14-1/2"
Ergo-One System Utility Cart, heavy duty: 2 shelf; 18" W x 27" L; 18-1/2"
Utility Cart - Angle Design - Stainless Steel: 2 shelf; 18" W x 27" L; 17"
Utility Cart - Angle Design - Stainless Steel: 2 shelf; 21" W x 33" L; 18-3/4"